Sciatica refers to pain or discomfort associated with the sciatic nerve. This nerve runs from the lumbar spine to the foot. Injury to or pressure on the sciatic nerve can cause the characteristic pain of sciatica: a sharp or burning pain or even numbness that radiates from the lower back or hip, possibly following the path of the sciatic nerve to the foot. Sciatica is a fairly common disorder, approximately 40% of the population experiences it at some point in their lives. However, only about 1% have coexisting sensory or motor deficits. Sciatic pain has several root causes and treatment may hinge upon the underlying problem. Of the identifiable causes of sciatic pain, lumbosacral radiculopathy and back strain are the most frequently suspected. The term lumbosacral refers to the lower part of the spine, and radiculopathy describes a problem with the spinal nerve roots that pass between the vertebrae and give rise to the sciatic nerve. This area between the vertebrae is cushioned with a disk of shock-absorbing tissue. If this disk shifts or is damaged through injury or disease, the spinal nerve root may be compressed by the shifted tissue or the vertebrae. This compression of the nerve roots sends a pain signal to the brain. Although the actual injury is to the nerve roots, the pain may be perceived as coming from any point along the sciatic nerve. The sciatic nerve can be compressed in other ways. 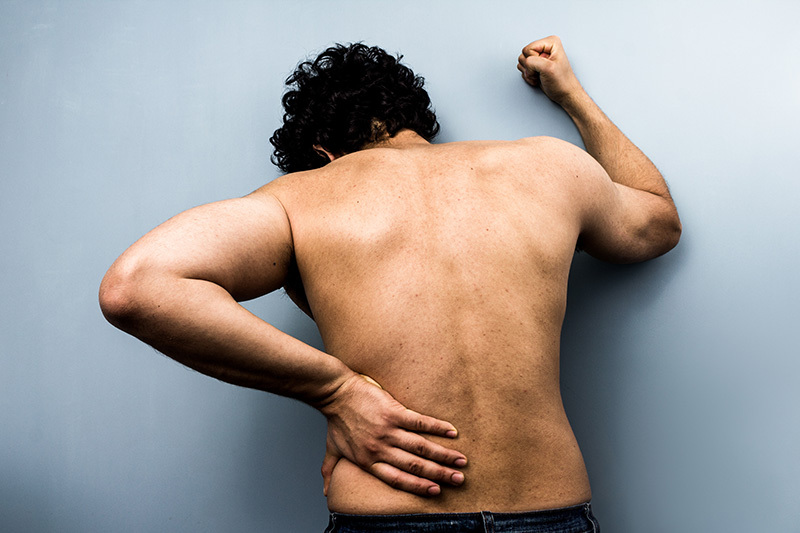 Back strain may cause muscle spasms in the lower back, placing pressure on the sciatic nerve. In rare cases, infection, cancer , bone inflammation, or other diseases may cause the pressure. More likely, but often overlooked, is the piriformis syndrome. As the sciatic nerve passes through the hip joint, it shares the space with several muscles. One of these muscles, the piriformis muscle, is closely associated with the sciatic nerve. In some people, the nerve actually runs through the muscle. If this muscle is injured or has a spasm, it places pressure on the sciatic nerve—in effect, compressing it. In many sciatica cases, the specific cause is never identified. About half of affected individuals recover from an episode within a month. Some cases can linger a few weeks longer and may require aggressive treatment. In other cases, the pain may return or potentially become chronic. Persons with sciatica may experience some lower back pain, but the most common symptom is pain that radiates through one buttock and down the back of the adjoining leg. The most identified cause of the pain is compression or pressure on the sciatic nerve. The extent of the pain varies among individuals. Some people describe pain that centers in the area of the hip, and others perceive discomfort all the way to the foot. The quality of the pain also varies; it may be described as tingling, burning, prickly, aching, or stabbing. Onset of sciatica can be sudden, but it can also develop gradually. The pain may be intermittent or continuous. Certain activities, such as bending, coughing, sneezing , or sitting, may make the pain worse. Chronic pain may arise from more than just compression on the nerve. According to some pain researchers, physical damage to a nerve is only half of the equation. A recent theory proposes that some nerve injuries result in a release of neurotransmitters and immune system chemicals that enhance and sustain a pain message. Even after the injury has healed or the damage has been repaired, the pain continues. Control of this abnormal type of pain is difficult. Back pain from disk disease, piriformis syndrome, and back strain must be differentiated from more serious conditions such as cancer or infection. Lumbar stenosis, an overgrowth of the covering layers of the vertebrae that narrows the spinal canal, must also be considered. The possibility that a difference in leg lengths is causing the pain should be evaluated; the problem can be easily be treated with a foot orthotic or built-up shoe. Massage is a recommended form of therapy, especially if the sciatic pain arises from muscle spasm. Symptoms may also be relieved by icing the painful area as soon as the pain occurs. Chiropractic may offer possible solutions for relieving pressure on the sciatic nerve and alleviating the accompanying pain and improving posture and preventing further episodes of sciatic pain. Acupuncture is another alternative approach that appears to offer relief to many persons with sciatica, as indicated by several clinical trials in the United States and Europe. The World Health Organization (WHO) lists sciatica as one of 40 conditions for which acupuncture is recognized as an appropriate complementary treatment. Initial treatment for sciatica focuses on pain relief. For acute or very painful flare-ups, the focus is to reduce inflammation and muscle spasms. If the pain is chronic then the piriformis muscle may be the source, particularly if there is evidence of nerve or nerve-root damage. Once this spasms decreases the active movement such as water exercise or walking should be incorporated. Patients are instructed in proper body mechanics to minimize symptoms during light lifting or other activities. Most cases of sciatica are treatable with manual therapy. After four to six weeks of treatment, an individual should be able to resume normal activities. Some sources of sciatica are not preventable, such as disk degeneration, back strain due to pregnancy , or accidental falls. Other sources of back strain, such as poor posture, overexertion, being overweight, or wearing high heels, can be corrected or avoided. Cigarette smoking may also predispose people to pain, and should be discontinued with the onset of pain. General suggestions for avoiding sciatica or preventing a repeat episode include sleeping on a firm mattress; using chairs with firm back support; and sitting with both feet flat on the floor. Habitually crossing the legs while sitting can place excess pressure on the sciatic nerve. Sitting for long periods of time can also place pressure on the sciatic nerves, so it is recommended to take short breaks and move around during the work day, during long trips, or in other situations that require sitting for extended periods of time. If lifting is required, the back should be kept straight and the legs should provide the lift. Regular exercise, such as swimming and walking, can strengthen back muscles and improve posture. Exercise can also help maintain a healthy weight and lessen the likelihood of back strain.